As Kentico Cloud continues to enhance the development quality of their product, they've recently rolled out several new excellent features. (For full details on all these enhancements, read Bryan Soltis' blog post here.) One new item I was particularly interested in exploring was Kentico Cloud's new Custom Activity Tracking feature. I was curious if I could connect it with Google Tag Manager (GTM) to produce an even more powerful analytics tool. The answer, I found, was yes: And integrating these two technologies is a surprisingly quick and simple process. 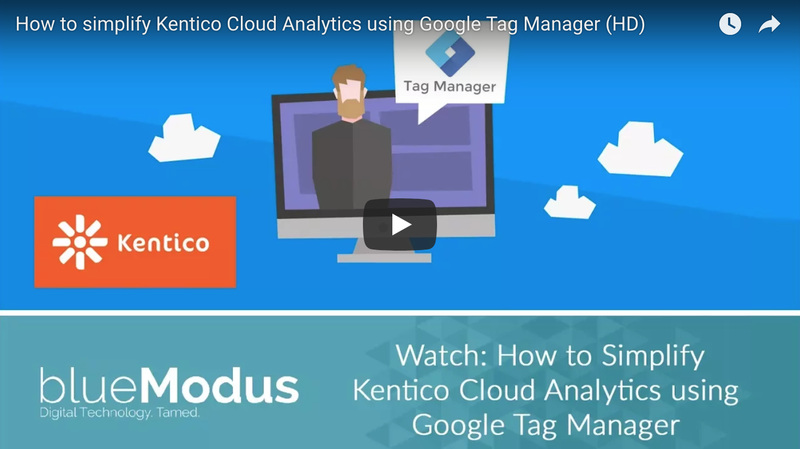 In the following video, I’ll demonstrate how easy it is to use Google Tag Manager with Kentico Cloud. You’ll also learn the secret to tracking large numbers of custom activities without creating hundreds of triggers and custom scripts. In summary, Google Tag Manager makes it easy to deploy Kentico Cloud Analytics, contact tracking, and custom activities. I'd highly recommend configuring it for any site you have running in Kentico Cloud. Click here if you'd like to download a copy of the HTML seen in the video, so you can review the markup and GTM tags. Do you have questions or comments on implementing Google Tag Manager in your site? Or any other MarTech video tutorials you'd like to see? If so, let me know!